Campeggio Sites & Paysages Domaine Catinière si trova a Honfleur, Calvados, è situato fiume/torrente. Questo campeggio dispone di piazzole delimitate, sia ombreggiate che, senza ombra e piazzole poco ombreggiate. È possibile affittare casemobili e bungalow. Il campeggio dispone di un parco giochi e di un campo sportivo. Ogni anno un ispettore visita il Campeggio Sites & Paysages Domaine Catinière, controllando oltre 200 tra attrezzature e altri punti di interesse del campeggio. L'ispettore è un dipendente ACSI e non lavora per il campeggio. Reasonable site but hard to find any information on the area from campsite staff, we found some lovely places nearby for ourselves. Biggest fault was that the showers were cold, this fact alone would prevent us from returning. The staff were very friendly and welcoming. They spoke good English and very helpful. That is about all the good things I found with this site. We were very disappointed. The people staying on the site were very noisy which spoilt what could have been a peaceful stay. The showers needed a lot of TLC and were generally dirty. They cubicles were small and not many hooks to hang your things. After showering and before getting fried my towel felt wet as there was no aeration in the showers. The toilets were outside and were often dirty. I realise it is the people who use them that leave them dirty, but there were lots of children who used them without adult supervision and didn't flush them! There were plenty of toilet facilities, but not enough as you often had to queue for them. The showers were not clearly marked and difficult to find. We did have a good day out on the cider trail, it was also convenient for Hornfleur which was a lovely place to visit, the parking however was expensive. Volete prenotare il campeggio Campeggio Sites & Paysages Domaine Catinière o oppure saperne di più? Potete farlo usando i seguenti dati oppure tramite il sito del campeggio. Dalla A13 uscita 28 Beuzeville, poi la D22 in direzione Honfleur. In alternativa da Pont de Normandie dopo 3,5 km a sinistra. 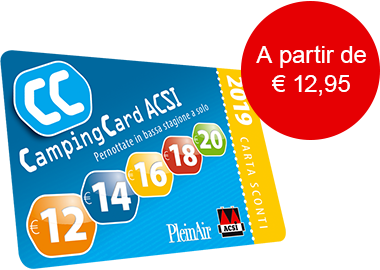 ACSI Eurocampings invia la tua richiesta di informazioni al "Campeggio Sites & Paysages Domaine Catinière".